Please Note This Converter is Through Way Type, Just Support The Same Resolution Input and Output. This Product Support Transfer The Resolution for Your Need. Video issue: When the video can't be displayed properly,please check if the resolution of both your signal source and monitor are the same. Please adjust the resolution of the input device to the same as the monitor. In general ,when the input and output device are the samt resolution , the video will display properly. Audio issue:When the sound can't output ,please set up the audio format and choose PCM format. We have : ONE-YEAR SOLID WARRANTY: Once you buy our product, you can get our 1 year warranty. For any defective product or product you aren't satisfied with, you can freely contact us for the full refund. 1.HDMI to YPbPr R/L converter Convert HDMI input into analog YPbPr video and R/L audio signal output Support OSD (On-Screen Display) for input and output resolutions,Support PS3, PS4, Blu-ray DVD, XBOX, Notebook and so on. 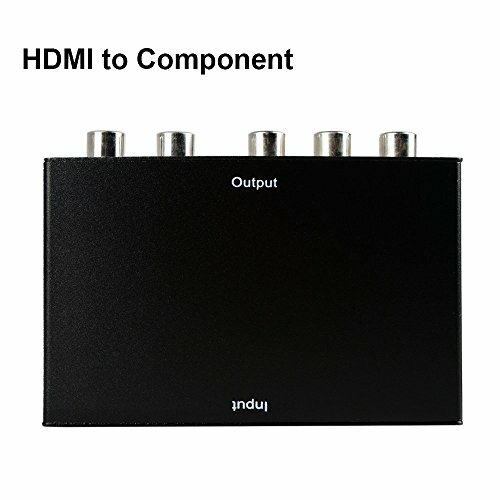 3.Supports HDMI 1.3 ,HDCP 1.2; Supports 165MHz/1.65Gbps per channel(6.75Gbps all channel) bandwidth for HDMI Input. 5.Easy installation & operation, no additional software needed. Power supplied by AC adapter directly. We have ONE-YEAR SOLID WARRANTY: Once you buy our product, you can get our 1 year warranty from ZAMO. For any defective product or product you aren't satisfied with, you can freely contact us for the full refund or a replacement.